When the Nissan badge goes on at one of our factories in America or anywhere else around the world, you can count on getting the full performance and durability that our engineers designed into that vehicle. When it’s time to replace parts, that precise fit and proper function will help you make faster repairs and ultimately help improve customer satisfaction and retention. Safety Standards: There’s no way of knowing if aftermarket products meet Nissan’s quality standards. Performance Standards: Genuine Nissan Parts are engineered to meet the same performance standards as when that vehicle was brand new. Dependable Quality: Parts made by third party manufacturers vary greatly in quality and there’s no easy way to discover if those parts meet all Nissan-validated fit, durability and performance requirements. 12-months/12,000 Miles (whichever occurs first) Limited Warranty4: Using Genuine Nissan Parts can also help preserve the vehicle’s warranty, which can be an important factor for many owners. Place your order now. 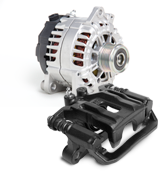 You’ll get access to our parts inventory, pricing, and illustrations, plus prices competitive to the aftermarket on thousands of popular parts1 every day! Purchase a subscription at nissan-techinfo.com to view technical service bulletins, service manuals, technical training options, security information, and much more. For repair tips and tech updates and to view TechNews magazine, visit NissanTechNews.com. NEED HELP WITH A REPAIR? When you are unsure how to fix it, call the no-fee Nissan Installer Repair Hotline powered by Identifix2: 1.855.828.4018. Email us for help finding participating Dealers, parts coverage, or additional program information: NissanWHSAdvProgram@nissan-usa.com.